The Groupe Park Avenue automobile consortium proudly announces the acquisition of the Montreal Silver Star Mercedes-Benz automobile franchise. Since March 24, the largest Mercedes-Benz dealership in Canada in terms of sales has actually been operating under the Park Avenue banner. Silver Star Mercedes-Benz was founded in 1991 and since then has been under the direction of Mr. Sam Eltes, a prominent figure in the Greater Montreal business community. Over time, this prestigious Montreal dealer built a solid reputation to become the success story it is today. To meet manufacturer standards and customer expectations, the facilities have undergone several waves of renovations over the past 15 years affecting all of its premises. A second mechanics shop on Royalmount Avenue, just minutes from the dealership, was set up to support the sales activities of pre-owned cars and auto maintenance. In fact, it has become the base for Silver Star Mercedes-Benz Express Service operations. In May 2015, the Eltes family announced the addition of a second Mercedes-Benz dealership: this time in the Toronto region. The founder’s passion for cars has passed on to his son, Jonathan Eltes, who operates the second dealership full-time. As a result, Mr. Eltes turned to Norman Hébert, President and CEO of Groupe Park Avenue, to secure the longevity of his Montreal dealership, and in March 2016 the deal was closed. The two businessmen greatly respect one another and have known each other for many years. “We will combine our strengths and expertise in the luxury automobile sector to continue growing and ensure premier customer service,” says Mr. Hébert. The main office of Silver Star Mercedes-Benz is at 7800 Décarie Boulevard in Montreal. This is also where the Parts and Service Department, in addition to the Sales Departments for new and pre-owned Mercedes-Benz vehicles, Sprinter vans and the Smart Roadster Coupe, do business. The vast inventory extends to its second location located at 5575 Royalmount Avenue, just minutes from the dealership. At this same address, customers can benefit from Silver Star Mercedes-Benz Express Service, and there is no shortage of shuttles to transport customers between the two locations. The team at Silver Star Mercedes-Benz has 200 employees across all departments. Some members have accumulated up to 40 years’ service within the family business. Staff stability is also one of the common values that brought about this natural alliance between Silver Star Mercedes-Benz and Groupe Park Avenue. The mechanics shop on Décarie Boulevard has 25 service bays, two AMG technical specialists, two Sprinter specialists and two more for the Smart banner. As for the Royalmount workshop, the 35 service bays are dedicated primarily to Express Service (or quick service) maintenance, where work is conducted on one vehicle by two specialists simultaneously. For more information about Express Service, see the video here. In 2015, over 20,000 visits to the Service Department were registered, representing 2 to 3 work orders per technician each day. Many services are available for our customers: in particular, valet, shuttle, courtesy, and of course online appointment booking. Inventory is divided into five departments: new vehicles, used vehicles, demonstration vehicles, Sprinter vans and Smart Cars. In 2015, Silver Star Mercedes-Benz recorded sales of 2600 vehicles. 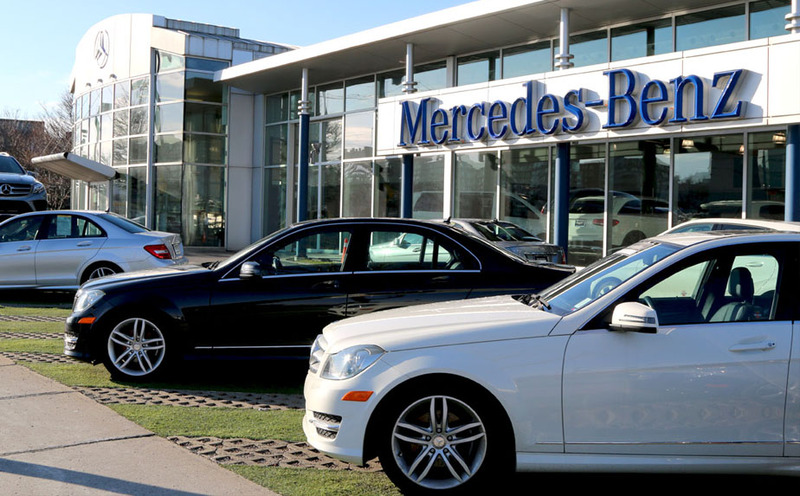 Silver Star Mercedes-Benz is Canada’s largest non-corporate dealer in terms of sales, with an average CSI (Customer Satisfaction Index) among the highest. As for their reputation on Google+, they average is 4.6/5 for 238 reviews. The Facebook page is updated several times a week to the delight of their 2000 fans. Following their page gives you access to various content: new products, news about the brand, dealer previews, etc. Follow the Facebook page by clicking here. Do you prefer the Instagram platform? Silver Star Mercedes-Benz currently has nearly 2000 photos! Exclusive pictures taken on the spot are available via Instagram here: @silverstarmtl. To view all the dealer videos, visit their Youtube channel here.